It's the first time both Michigan and Michigan State have ever been undefeated this late in the conference season. Adreian Payne’s right foot might be the most important appendage in the state of Michigan this weekend. Thanks to Branden Dawson’s bizarre decision to punch a table Thursday, Payne’s sprained foot could put Michigan State at a severe disadvantage in Saturday’s historic matchup with Michigan. If he can’t play for the first time since Jan. 7, the Spartans will go into the game with a post presence made up of Matt Costello, Alex Gauna, Kenny Kaminski and Gavin Schilling. When Mitch McGary had to undergo back surgery, it appeared that the Spartans would have a huge advantage inside when Michigan came to town, but that’s changed. Besides the injuries to Payne and Dawson, Jordan Morgan and Jon Horford have given the Wolverines a consistent double-double while splitting the center position, cutting down the impact of McGary’s absence. That’s helped Michigan upset two straight top-10 teams — Wisconsin and Iowa — and set up the matchup between the last two undefeated teams in the Big Ten. It’s the first time both schools have ever been undefeated this late in the conference season, and Saturday’s winner will take control of the race. Even with Payne injured, Michigan State would have been the favorite because of the way Dawson stepped up in the four games that Payne has missed. He averaged 8.5 points and 9.0 rebounds, but put himself out of action when he got frustrated while watching game film and slammed his fist into a table. That resulted in a broken hand and 4-5 weeks on the sidelines. That means that, unless Tom Izzo is willing to play Payne at less than 100 percent, Michigan State faces serious matchup problems with the Wolverines. They could go with a fairly normal lineup, with Costello at center and Kaminski at power forward, but that would mean the latter would have to guard Glenn Robinson III — a tough task for a freshman who has only been in the rotation for three weeks. Izzo’s other option would be to go with a small lineup, moving Denzel Valentine from small forward to power forward, and playing a three-guard group of Keith Appling, Gary Harris and Travis Trice. 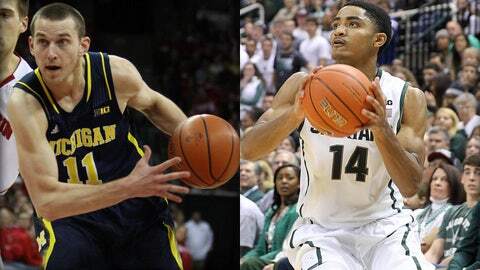 Valentine would match up well with Robinson, being only an inch shorter, but the 6’0" Trice would have to guard either Caris LeVert or Nik Stauskas, both of whom are 6’6". Given Stauskas’ ability to score against bigger opponents, he would almost certainly dominate a matchup with Trice, but Harris against Stauskas and Trice against LeVert would only be the lesser of two major evils. John Beilein will also have freshman Zak Irvin, also 6’6", coming off the bench to give the Spartans another headache. Irvin hasn’t developed the dribble penetration that has made Stauskas a nightmare for defenders, but he’s still able to play either forward position while shooting over 40 percent on 3-pointers. Michigan comes into the game ranked in the nation’s top-5 offenses, while the Spartans are 18-1 thanks to a top-10 defense, so the losses of Payne and Dawson will hurt Michigan State in the game’s key matchup. It also hurts them on the offensive end, where Payne and Dawson are the team’s most efficient scorers. Harris is going to have to have a big game, while Appling and Trice will need to hit enough 3-pointers to keep up with Stauskas and Irvin. For the Wolverines, they just need to keep playing the way they have against Wisconsin and Iowa, but that’s harder than it sounds. Most of the players remember getting crushed 75-52 last season at the Breslin Center, and Morgan and Horford are the only players to have experienced a victory in East Lansing. No matter how banged up Michigan State might be, they know the Izzone will be in full roar around the court. They will have to hope the noise, and possibly a limping Payne, will be enough to flip a matchup that suddenly seems to favor the Wolverines.